CNP Santander Insurance has invested €3.5m into new high-tech offices in Dublin to support the group's significant expansion here. The Irish-based company, a joint venture with Santander bank and French insurance provider CNP, has trebled its employee headcount over the last three years. Currently designing and managing insurance products for distribution in more than 10 European countries, the addition of 60 new roles has stemmed from the firm's rapid expansion of product range and market reach. CNP Santander's new home, a 21,000sq ft space at Three Park Place in Hatch Street, included ergonomic desks and chairs for all employees, and sound-proof pods and meeting rooms with videoconferencing and audio-visual tech capabilities. CEO Tony Beckwith said that the investment has a dual purpose: accommodation for the growing team and an environment that encourages collaboration and productivity. 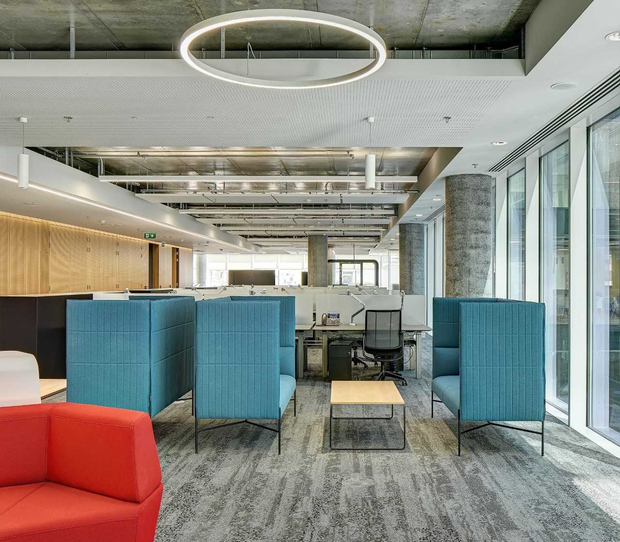 "At all points of the design process with Todd Architects, we kept innovation in mind and worked with our staff to make decisions regarding the layout and furnishings," he said. "For example, we have created a number of breakout areas throughout the office, as well as a communal kitchen area where breakfast is provided every morning." CNP Santander Insurance was recently recognised as one of Ireland's Best Workplaces.